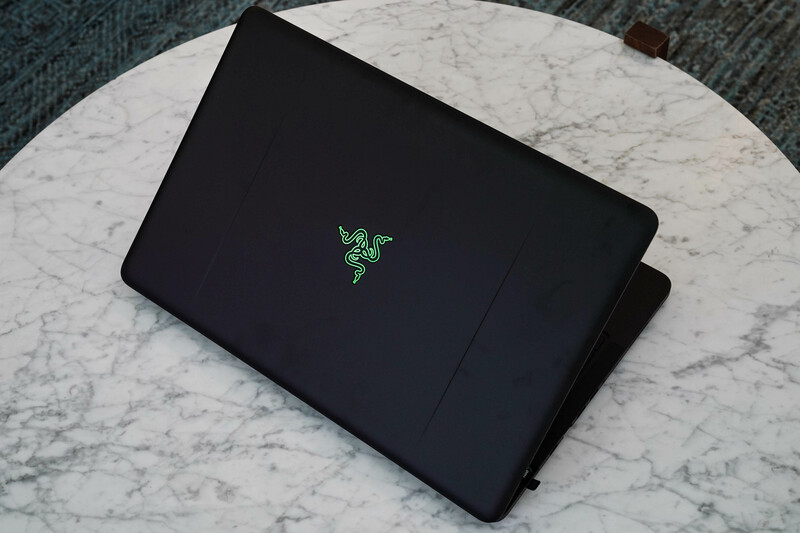 When Razer bought THX off of George Lucas’ hands, no one knew what they’d use their new multimedia technology arm for — until they announced the improvements to their most powerful laptop: the Blade Pro. The result is the Blade Pro THX, a new laptop with a color corrected 4K G-Sync display and Dolby 7.1 audio port. With these improvements, Razer has created a certified production machine. 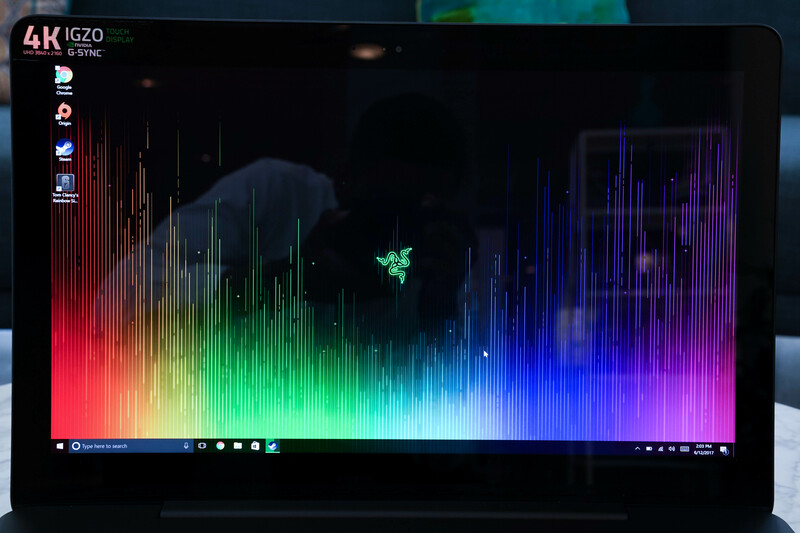 In fact, Razer is so confident the Blade Pro THX can be a production-level rig that they’re bundling FL Studio — the music production suite used in nearly every genre of music, but especially hip-hop. But is this 17-inch, $4,000 machine — you read that right — what production professionals and gamers looking for in an all-in-one package? Also, is cooling the Blade THX a problem? Is THX color/sound correction all it’s cracked up to be? Back in June, I began testing Windows gaming machines like the AERO15 that feature color correction as a feature. Why is this important? It means what you see on-screen is accurate and is as “true to color” as possible. If you’re a designer, editor, photographer or just about anyone who cares about the visual representation (and reproduction) of your work, then this matters. If you’re a Mac user, this has never really been a problem, as Apple tunes their color profiles on top of having great displays. Recently, Windows 10 manufacturers are starting to really care about reaching that 100 percent Adobe RGB color gamut. 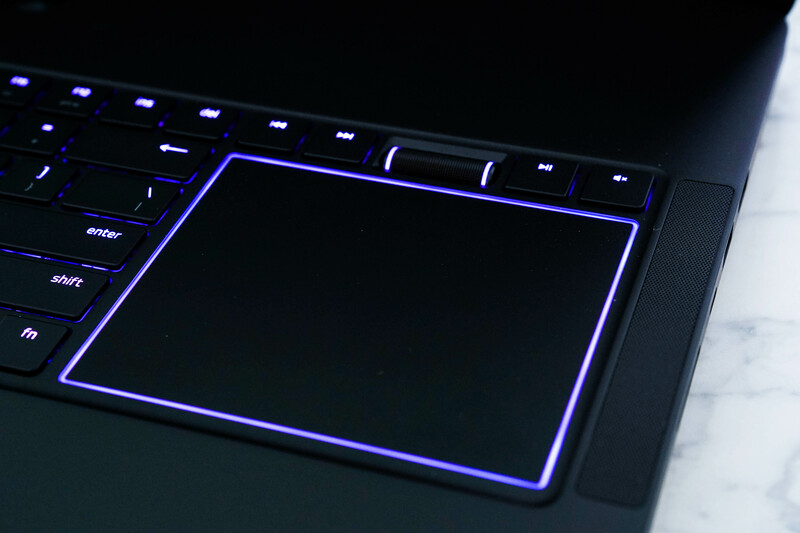 The Blade Pro THX covers virtually all colors recognized by Adobe applications — including just keeping an accurate color profile — as a feature. Also, having a THX color profile thanks to their acquisition of the company also gives it an edge when editing or watching video, or just playing games. When you look across the spectrum of Windows machines, there’s inconsistency in correct color profiles. For example, a tablet computer like the just-reviewed HP Spectre x2 — one of its main features is to serve as an artistic tool — only has a 72 percent color gamut rating; Microsoft’s Surface Pro scores 75 percent. 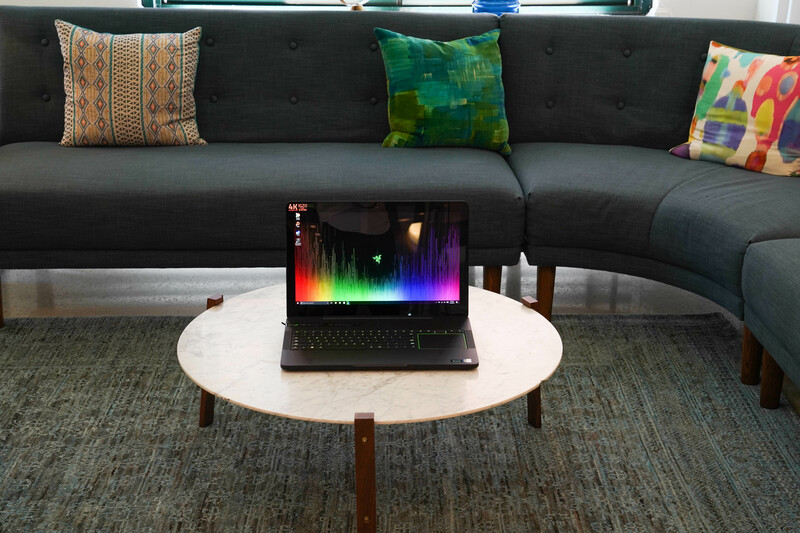 Meanwhile, an older Razer laptop like the 12.5-inch Blade Stealth has maintained a 100 percent rating for the past two hardware generations. But the AERO15 I mentioned earlier? It scored 60 percent. There just isn’t much consistency across brands. I can’t dismiss the fact that Windows manufacturers are making an effort, but I can say it’s about time. As for audio, the improvements over the regular Blade 17″ (and most other large laptops) aren’t as dramatic. The Blade THX will definitely fill a room and give you some bass kick, but if you’re trying to become the next Metro Boomin’, then you’ll need to look elsewhere for your audio fidelity needs. Actually, outputting audio elsewhere is where the THX certification shines. Razer hasn’t only tuned the onboard speakers and drivers, but the 3.5mm audio jack as well. It supports Dolby 7.1 and both input/output via the same port. It’s quite a nice touch. Here’s what you get for ports: Ethernet, an SDXC slot, three USB 3.0, one HDMI 2.0, Kensington lock, 3.5mm audio jack and a Thunderbolt 3 (USB-C). There’s no need to question Razer’s gaming pedigree; the last two generations of Blade machines have always had high-end specs. Basically, whatever you throw at it, the Blade Pro THX will run at full settings, at 4K resolution. And if by some chance you’re not hitting at least 60 frames-per-second, you can always downscale the in-game screen resolution to compensate. The crispness, use of G-Sync to eliminate screen tearing, and color accuracy definitely helps in fooling your eyes, even if just for a minute. If it’s somehow not powerful enough for your work, then you’re obviously in need of a real desktop. 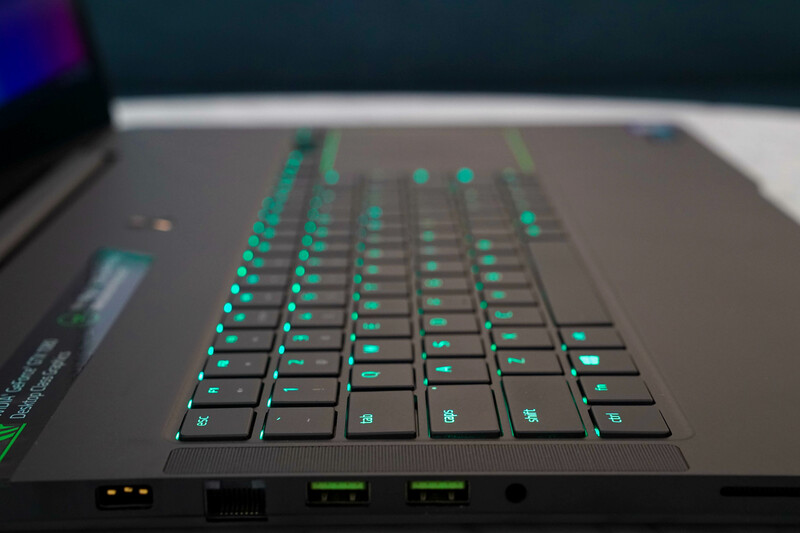 To start the show, the Blade Pro THX sports one of the most powerful mobile processors: a quad-core, 7th-generation Core i7 at 2.9GHz (base clock), 3.9GHz (boost clock) and tops out at 4.3GHz (overclock). If it’s somehow not powerful enough for your work, then you’re obviously in need of a real desktop. For visuals, you get an NVIDIA GTX 1080 graphics card with 8GB GDDR5 memory (again, insane for a laptop), a whopping 32GB RAM and finally, a 512GB solid state drive for storage (with one and two terabyte options). In the end, the whole package weighs 7.69 pounds and is 0.88-inch thin; by no means a mobile warrior, but it can be carried around. Of course, there’s a catch (or two). To keep cool and intact, Razer has different fan profiles you can set, but the sound reaches 60 decibels when measured with a phone app. This laptop has such loud and bombastic fans that I could even hear them over the gameplay on my headphones, set to 50 percent volume. People sitting in my vicinity thought an air conditioner had turned on; this is not a laptop that is kind to shared work spaces. 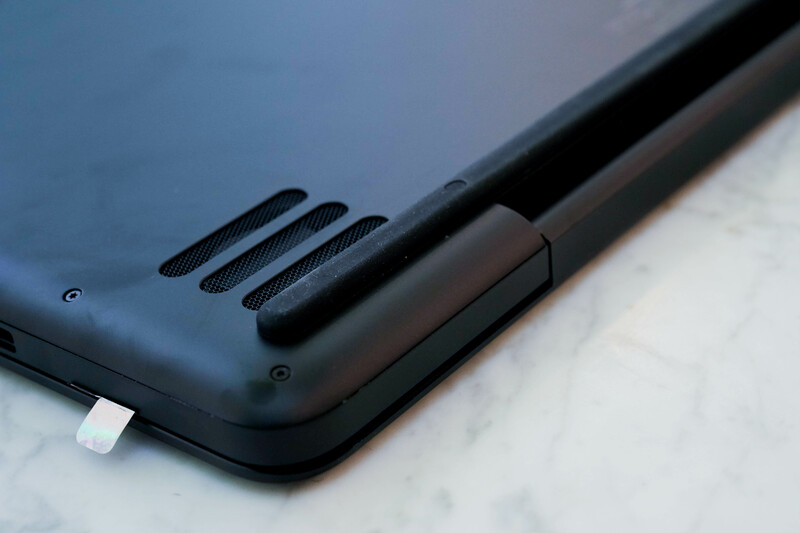 Furthermore, despite the copper thermal heatsink and jet turbines for fans, the palm rest gets uncomfortably hot. It’s a shame really and is something I’m trying to better understand by talking to Razer engineers. People sitting in my vicinity thought an air conditioner had turned on; this is not a laptop that is kind to shared work spaces. For a company that makes gaming peripherals, I wasn’t disappointed in the feedback or key travel of the mechanical keyboard or the unusually positioned touchpad. You’d never use the latter to play games, but it is usable and eventually, you get used to it. Of course, the Blade Pro THX has a 99Wh battery. Of course, it’s not like you’d notice; the battery drains within two hours when used in High Performance Mode. Longevity is not what Razer designed it for, but technically you should always use this laptop with the power brick. This is the most powerful computer that Razer has ever produced, with the highest starting price. $4,000 for a 4K laptop seems uncanny to most, but it’s well worth it when you know what you’re getting. This is a true creative’s desktop in a laptop, without being as thick as a textbook. I give high marks to Razer for accomplishing that feat alone. 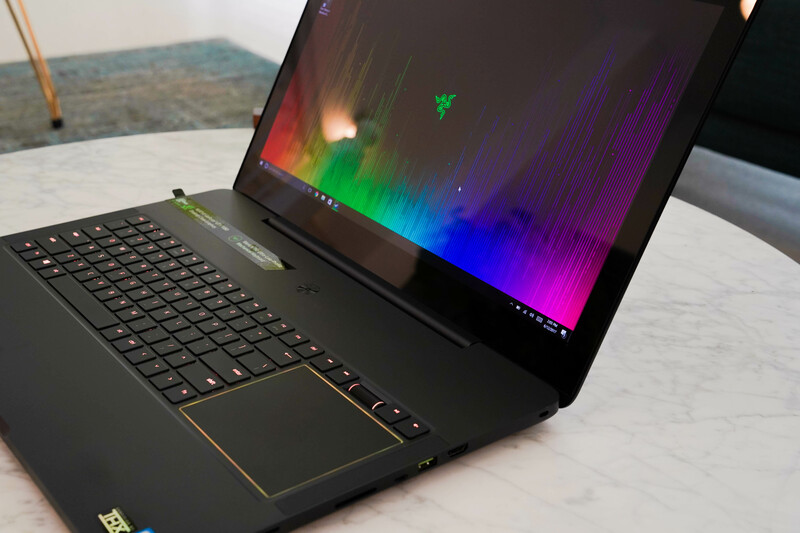 Right now, this is the most well-rounded, high-end desktop replacement laptop — at least until NVIDIA’s Max Q is in more gaming laptops by the end of year. However, it’s also the Blade with the most faults: it runs hot, loud and competes with top-tier desktop pricing. If this is too much for you, most of the Blade THX’s best traits trickle down into their smaller models, which hopefully will also receive THX certification in the future.